For any inquiries regarding the PhD Forum please contact the Program & Organizing Committee Chair Ognjen Dobrijevic. Important note: For the final manuscript submission, no copyright form needs to be uploaded (this has also been disabled in EDAS). 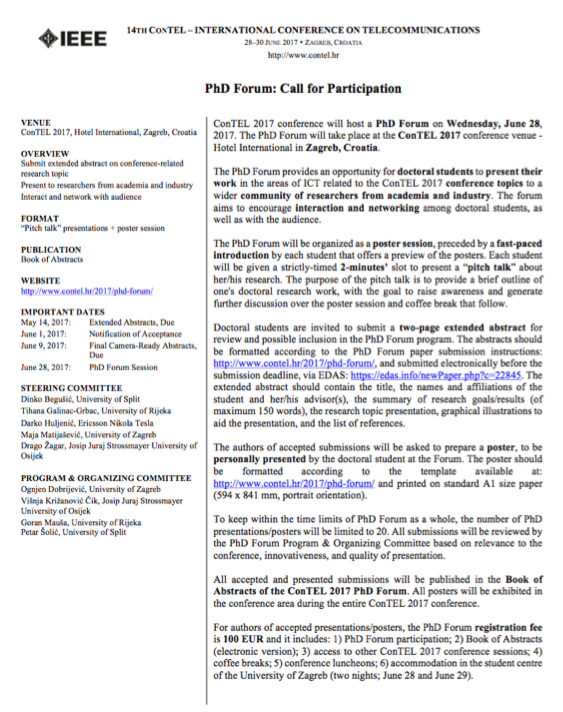 ConTEL 2017 conference will host a PhD Forum on Wednesday, June 28, 2017. The PhD Forum will take place at the ConTEL 2017 conference venue – Hotel International in Zagreb, Croatia. The PhD Forum provides an opportunity for doctoral students to present their work in the areas of ICT related to the ConTEL 2017 conference topics to a wider community of researchers from academia and industry. The forum aims to encourage interaction and networking among doctoral students, as well as with the audience. The PhD Forum will be organized as a poster session, preceded by a fast-paced introduction by each student that offers a preview of the posters. Each student will be given a strictly-timed 2-minutes’ slot to present a “pitch talk” about her/his research. The purpose of the pitch talk is to provide a brief outline of one’s doctoral research work, with the goal to raise awareness and generate further discussion over the poster session and coffee break that follow. The abstracts should be submitted before the submission deadline via EDAS: https://edas.info/newPaper.php?c=22845. The extended abstract should contain the title, the names and affiliations of the student and her/his advisor(s), the summary of research goals/results (of maximum 150 words), the research topic presentation, graphical illustrations to aid the presentation, and the list of references. For more information please refer to Call For Participation.